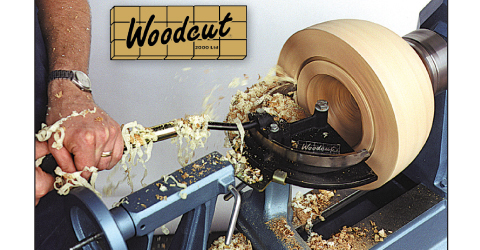 During testing, we cored over 300 bowls with this Bowl Saver from Woodcut Tools and found it to be a safe and easy way to maximize your wood by getting more than one bowl from a blank. Two high strength blades with Stellite Cutters are included to makes bowl cores from 3" to 12" up to 5" deep. Stellite is a material that will hold an edge well. Even so, we recommend sharpening with a few strokes of with a diamond hone after each core to keep the cutter as sharp as possible. This will lengthen the life of the cutter. The knife should cut up to 500 bowls before needing to be re-tipped. The manufacturer recommends having a saw shop braise a new tip on professionally. We sell replacement tips and also knives that have the tips installed. Template pattern for setting bowl depth is included. A handle is included with the system that can also be used as a tool handle for 1/2" diameter tools when not coring bowls. The patented design of the Bowl Saver allows it to be supported with the tool rest base and fit into the #2 Morse Taper of the Tailstock. This gives solid support for the Bowl Saver to reduce vibration.